I should really mention that there is a VERY IMPORTANT PAPERBACK out today. 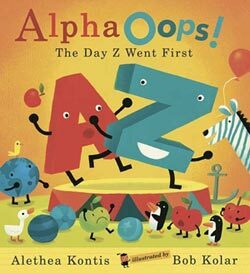 AlphaOops: The Day Z Went First is now available in paperback for the very first time anywhere! I’m so very honored, because 1.) you have to be a Very Important picture book for your publisher to release you into paperback and 2.) this is the very first book I’ve ever had (not counting Elemental, because it was a hard/paper simultaneous publication) that has come out in paperback after being first released in hardcover! If you own AlphaOops: The Day Z Went First, I encourage you to take advantage of this lovely low price point (only $6.99) and buy a few copies for friends, neighbors, and teachers. It makes a great baby shower gift or addition to any library. While you’re on the Amazon page, please feel free to “Like” the page, tag it, review it, or post it to your social networks, with my sincerest thanks. And remember, when you read this aloud: DO IT WITH FEELING. This entry was written by Princess Alethea and posted on July 10, 2012 at 12:46 pm and filed under Books, New Things, writing. Bookmark the permalink. Follow any comments here with the RSS feed for this post.